It doesn't matter who you are or what you do: you should go pick up this book whenever you have the chance. Wonder Women tells about the many inventions and contributions women have made throughout history, and it does so in an incredibly engaging and informative manner. 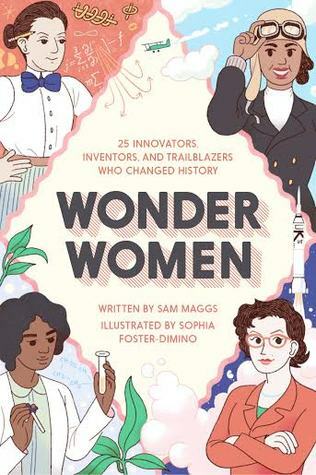 Out of the many incredible women spotlighted in this book, I am almost embarrassed to say that I had only heard of a small handful prior to reading Wonder Women! This is such an incredibly needed and important book that brings to light the accomplishments of women in the fields of science, medicine, espionage, innovation, and adventure. I think it is astounding how many women have made such huge marks throughout history, but yet have very little notice - if any at all - in many textbooks and history books! Where were all of these women when I was learning history in my early schooling? For that matter: where are they still? Each profile was the perfect length that provided well-researched and detailed information about each woman and her impact; there was no excessive rambling or extensive information that could potentially turn away some readers. Also, a bonus to this already great book is the list of resources listed in the back pages that offer an abundance of websites and organizations that girls can explore and join in order to follow their own dreams. The only negative reaction I had to this book was how disappointed I felt that I am not a part of the scientific community - but fortunately this has nothing to do with the writing or content of the book itself, just my own feelings. I used to want to enter the world of science, but I soon realized that it simply is not something I was born to do, and I excel much more in other areas. Still, I love reading about the many accomplishments that all of these women have accomplished over the years, and I am almost sure that you will, too! Quite frankly, I don't know I could give this wonderful book anything less than five stars!